Controversy has surfaced over whether or not annual standardized tests around the country are necessary. Parents and students say that these tests cause unneeded stress and strenuous studying. Many agree that it wastes money and time. While some administrators say it is a good way to collect data and improve future programs. According to a study by the Council of the Great City Schools, students spend 20 to 25 hours per year taking standardized tests. The American Federation of Teachers report claims that test preparation and testing absorbs 20-45 days depending on where you live. Dr. Libano, principal at Sharon High School, sees the pros and cons of standardized testing. “It depends on the school district and the socioeconomic makeup of the community. Standardized tests should not be used as a singular measurement to judge schools. There is so much more that happens in schools that make school communities proud,” he said. He added that the tests are more beneficial in bigger districts with more poverty as it may be more complicated to measure academic gains. Alan Janson, a parent in the Sharon community, sees the positives of the testing. “Standardized tests are beneficial for teachers to understand how effectively they are educating students in relation to other school districts. It is a great way to validate curriculums. Data collected by these tests will benefit school districts as a whole in the future,” he said. “On the other hand, kids study for standardized tests because they fear it affects future placement. The tests should focus on how well students have been learning throughout the course. When kids start cramming for standardized tests, the burden is on them to perform well for their futures,” he added. Dr Libano understands that students may react differently to the tests. “Stress is different for every single person. Some people may not stress one bit about a standardized test. And some may stress a lot. It all depends on the individual. I do not think that anybody can quantify that,” he said. Ms. Weston, a 9th grade English teacher, recognizes the effects of standardized testing on schools. “Standardized tests are a good idea in principle to be sure that students are being equally educated. But they do increase stress. Sometimes, teachers, especially in the elementary school grades, are forced to change curriculum and teach to the test,” she said. “The tests have a cumulative effect because the students are tested at such a young age and those tests continue. Especially such standardized tests that prohibit students from going to certain colleges,” she added. Dr. Libano sees the divide between opinions. 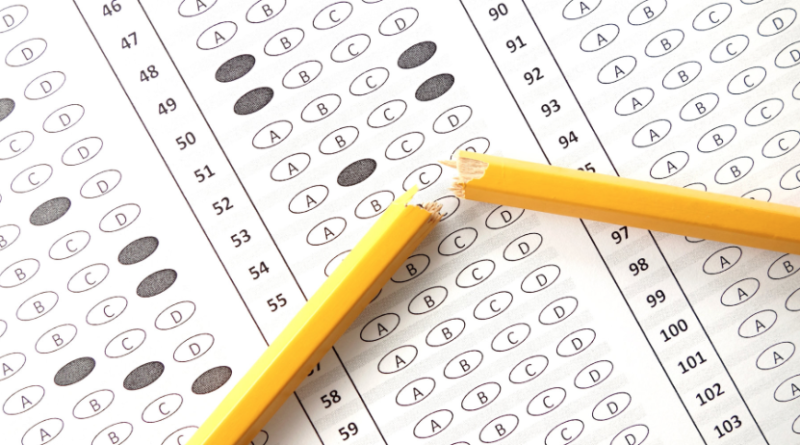 “It is debatable whether or not standardized tests should be a graduation requirement. AP exams are a type of standardized test. Some argue that those are a waste of time. Others would argue that they are very beneficial,” he said. “These tests should not take away from the creativity that happens in classrooms. Or take up an inordinate amount of resources that allow school to operate, for teachers to teach,” he added. Ms. Weston says different districts might benefit from the tests. “I do not know that students benefit from the actual taking of the tests. In some areas of the country, students benefit from the curriculum changing in order to equalize the education. But in districts like ours where education is valued in the first place, I do not think it changes based on meeting the requirements of a test,” she said. “The data collected could benefit the school systems because districts that are not able to meet the requirements could receive extra aid, help or more teaching staff in order to help those districts teach their students in ways that would help them learn,” said Ms. Weston.